Memento Mori is Michaël’s debut feature film about a girl who’s stuck in a dream circle, reliving key moments of a traumatic event. What happened to her? And will she survive this nightmare before time runs out? An employer brand movie made for the medical software company MIPS, in their mission to hire talented developers to make incredible, life-saving medical software. For the 2018 campaign of the paint store Colora, we made 2 different videos with each a version for Youtube (16:9), Facebook (1:1) and Instagram purposes. A commercial for promoting an exclusive masquerade ball. A short film/documentary about diabetes Type 1 ex-professional cyclist and good friend Kevin De Mesmaeker, who unfortunately had to quit due to medical reasons. Fight for your dreams is a message to support all the people who don't stop fighting in life and keep exercising their passion! A commercial about the Bootcamp24 training sessions to become stronger, leaner and fitter without the help of any fancy equipment, tools or materials and the use of the elements that nature offer us. A commercial made for the "Christelijke Mutualiteit" with a clear message that you can't believe everything you read on the internet about medical issues. False information can seriously hurt you! Be smart, contact a local doctor when you've got questions. To fill up the emptiness in her life, Fien makes some extreme decisions to make sure she’s never alone again. 24/10/2014: 'Leegte' has his first selection at the Internationaal Short Film Festival Leuven, national competition 2014. 12/02/2015: short film 'Leegte' will be screened at the Ciné Privé film festival. 14/03/2015: 'Leegte' will be screened at the Flanders Week in Gdansk (Poland). A horror/comedy short film about a young couple who gets disturbed after a romantic dinner. The short film will open the film festival on the ‘opening night’ on the 19th of february 2015. 12/02/2016: The Disturber will be the ‘opening film’ at the Popcorn Fright Nights special anniversary screening of Wes Craven’s SCREAM in Miami. (USA) A great honour! 07/04/2016: The Disturber has been selected for the International Vampire Film & Arts Festival in Transylvania. (Romania) Thank you Dracula! 31/05/2016: Our first award! 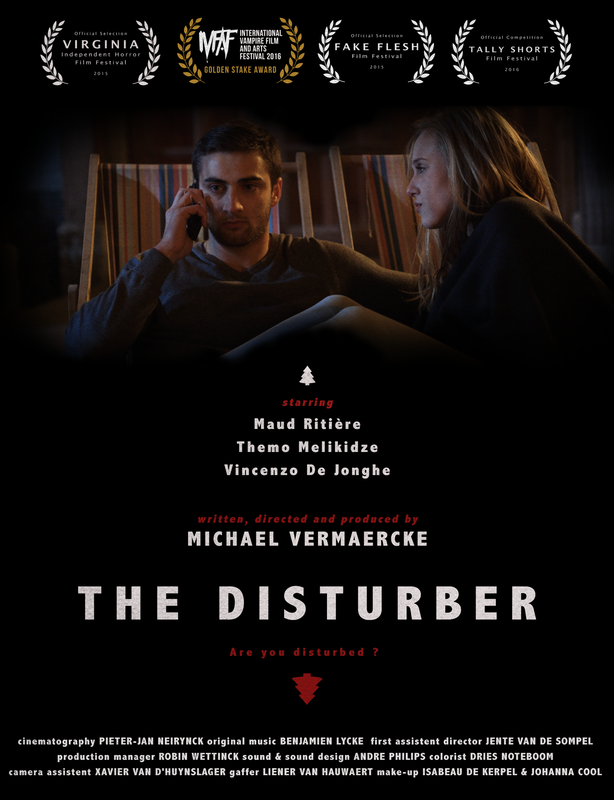 The Disturber wins a Golden Stake Award at the International Vampire Film & Arts Festival. And a couple of screenings in various theaters around Belgium.